Before I continue, please let me congratulate a few people here. This Merdeka spirit is certainly in the air now. I would like to congratulate the Malaysian SEA Games 2017 team for the highest Gold medal tally thus far. 145 Gold medals bagged out of 404 out for grabs. That accounts for 35.9 percent of Gold medals for this Games. The last time we had SEA Games here in Kuala Lumpur we could only manage 111 out of 391, and that made only 28.4 percent. If anyone were to put a “Rindu Zaman Mahathir” hashtag to KL2017, this would be the best time to do so. 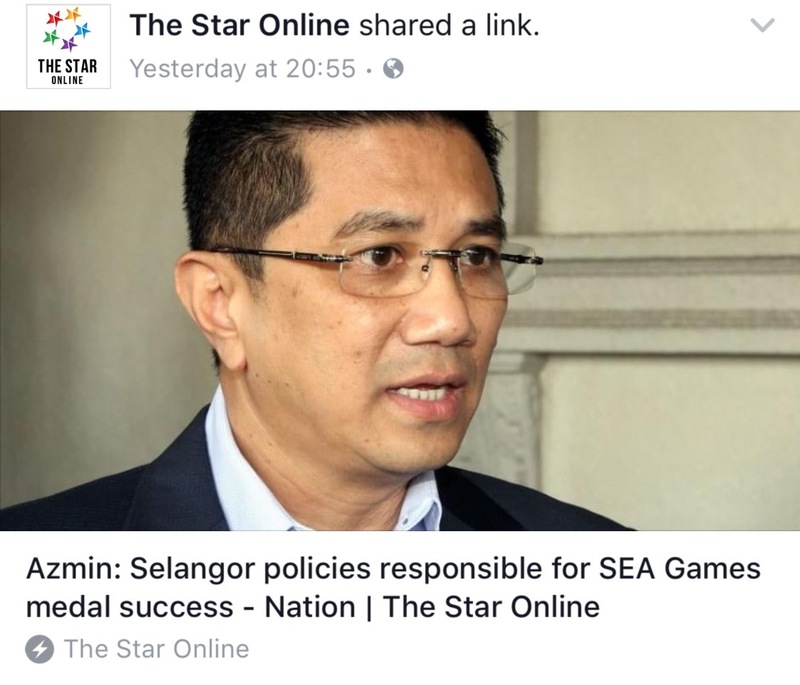 Quick to claim credit for Malaysia’s victory is Azmin Ali who said that it was Selangor’s policies that had helped Malaysia achieve this victory. Someone should remind that this is not SUKMA or MSSM. This was a national effort and many Gold medals also came from people who are not part of Selangor. Secondly, I would like to congratulate Mr Sotong himself. 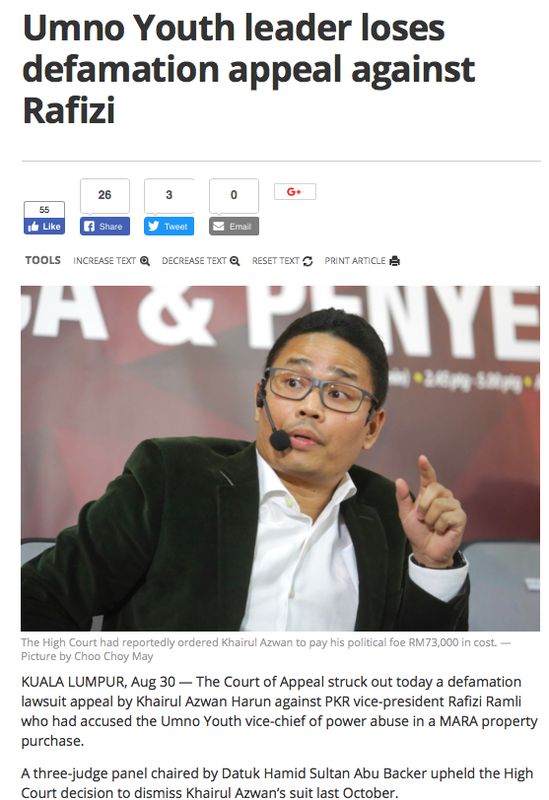 Yes, today the Appellate Court awarded him with RM10,000 which Pemuda UMNO’s Azwan Bro has to pay on top of the RM1.5 million he managed to squeeze out of 7,000 odd “donors” who believe in his dysfunctional NGO, that had gotten fellow party member Latheefa Koya’s boxers in knots, accusing Rafizi of getting help from the Deputy Prime Minister. Maybe Latheefa has realised that not once has Rafizi ever attacked the DPM openly, not after 21 August 2013. 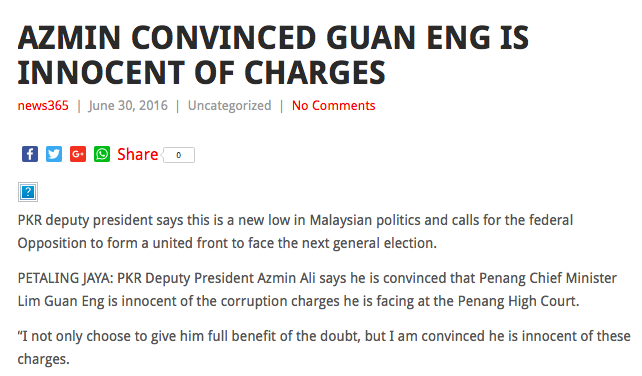 But with Najib Razak, no matter how many times he’s found guilty for telling lies, he keeps up his attacks. Maybe Rafizi is an UMNO agent as claimed. It does make you wonder doesn’t it? Only Rafizi can answer this. My final congratulation goes out to the Judiciary system for proving time and time again that it is free from political influence. 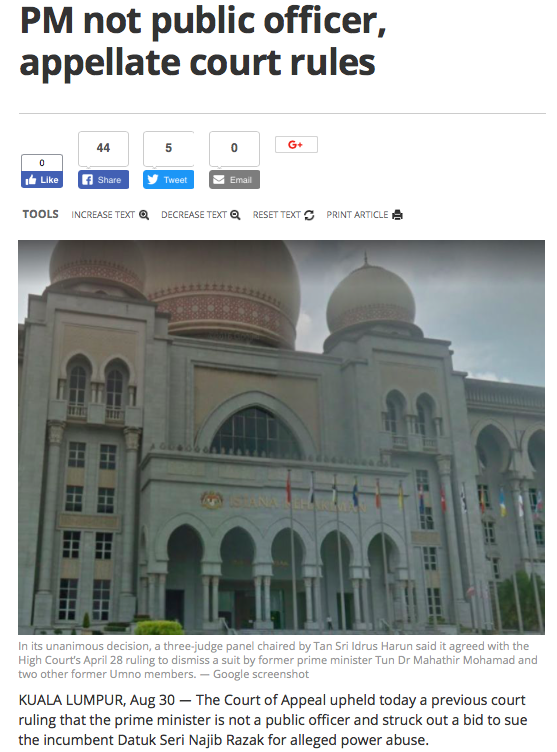 The same Court that gave Mr Sotong RM10,000 also found U-Turn Mahathir’s claim and insistence that Najib Razak is a ‘public officer‘ is a total FARCE. The verdict could have gone the other way round had this taken place before 2003, and those who love the “Rindu Zaman Mahathir” hashtag should again apply the hashtag to this event. Now, back to the main story. Today, two people attacked the MACC using the same points. They are R Nadeswaran, a former journalist last seen wth the Sun Daily, and Eric Paulsen the lawyer who is never seen upholding the law and is always challenging the spirit of the Federal Constitution. But back in those days the MACC was the darling of the Opposition too. 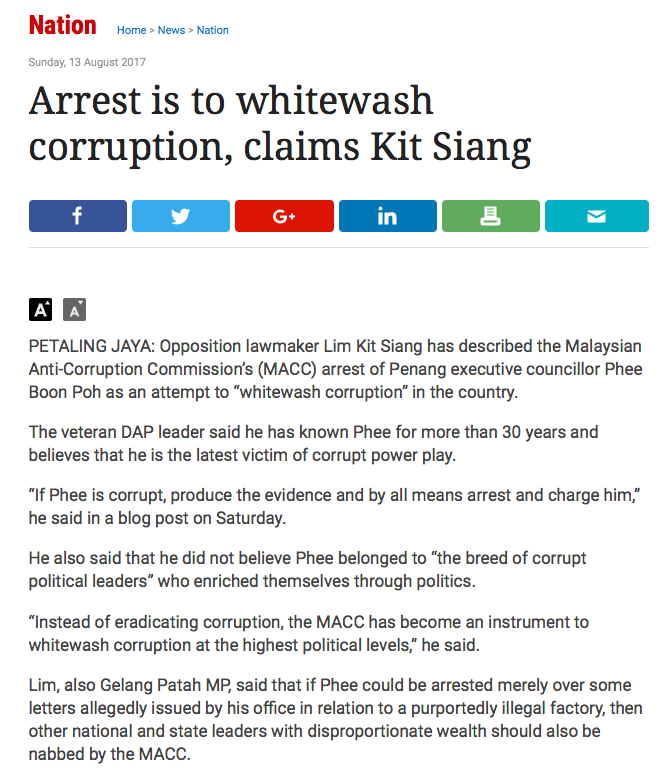 I am sure you would all remember how glory-hunter Lim Kit Siang told the world that the MACC’s crusade must be supported. stuff now shall we? Else we could also use the “Rindu Zaman Mahathir” hashtag here too and do comparisons on how many whales and sharks have been arrested by the MACC’s predecessors. Lim Kit Siang et al stopped supporting the MACC’s crusade when several of theirs have been found to be whales and sharks too! Where is the consistency in fighting corruption here? Eric Paulsen even added why must MACC take such an intolerant and extreme view when the issue being commented upon is of public interest? For Eric Paulsen MACC is being intolerant as, as put by Nades, in the past there had been lots of opportunities for the MACC to sue people but never did. Again, that’s in the past. I wonder if either Nades or Eric Paulsen realised that none of those making noise in the World Wide Web over MACC’s catching of small fries were under investigation, as Phee Boon Poh still is. He was released from remand and is still under investigation. He has not been exonerated from any offence nor has he had any charge dropped. And as Phee Boon Poh was remanded by the order of a Magistrate, who, in the opinion of the High Court, had erred, how does receiving a Magistrate’s remand order and executing the order be an illegal detention as the Opposition is trying to paint? A Magistrate acts within the ambits of the law. He interpreted the law in his learned capacity. It was the High Court that had a different interpretation. And now the MACC is asking the Appellate Court (yes the one that made Sotong a victor and Mr U-Turn a loser) for its interpretation of the same. And again, a reminder, Phee Boon Poh is still being investigated. He has not been charged and then found not guilty. 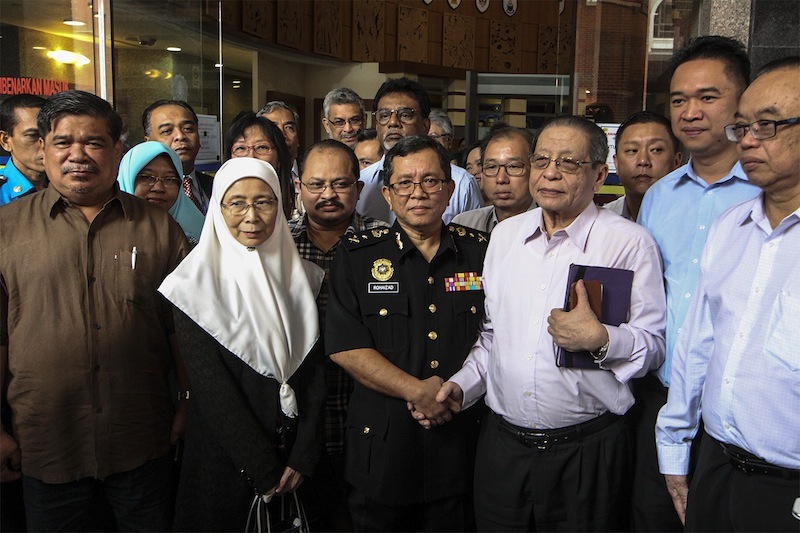 The remand would only have been illegal only if the MACC refuses to release Phee after the remand order was set aside. As for Nades, a big fish such as a whale or a shark would be nothing less than having Najib Razak in the accused dock. Such view is already biased and myopic. Which is the reason I do not refer to him according to his nom de plume CITIZEN Nades, as I too, am a CITIZEN and he does not speak on behalf of me. Nades asked why has the MACC not said anything about the SRC International which, accroding to Nades, was investigated by the MACC but they had nothing to show, implying that the investigation has already been concluded. This is the peeve that I and a few defence bloggers have about the quality f our journalists – they don’t read. They often wait to be spoonfed with press releases and type away so that the agency they represent would be the first to publish it. However, investigation papers have been opened for the people who actually ran SRC International and that is still in the investigation process. Must MACC tell everything about the case to the whole world? Even DAP’s darling Pony Tua, Mr Tell-All-BS, who is a member of the PAC found that Najib Razak is not accountable for 1MDB’s dealings. Yes, he agreed to that and signed the PAC report on 1MDB. He, and several other PAC members from the Opposition. So, there have you. 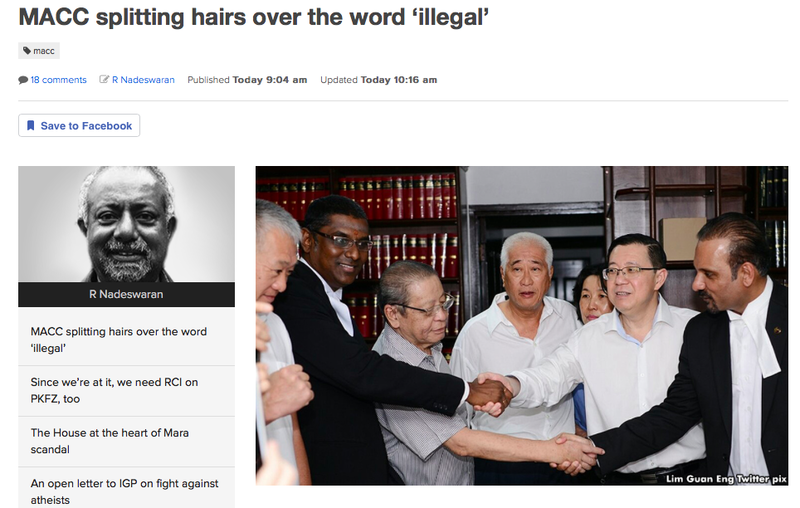 Phee Boon Poh is being investigated so he should not make any statement trying to influence a court of public opinion. And neither Lim Guan Eng, nor Nades, nor Eric Paulsen should also try to unfluence a court of public opinion by saying that Phee Boon Poh was illegally detained. Lastly, The Star has again published something by socialist law teacher Azmi Sharom who goes on and on about how we have voted for the same people every time there is a general election despite popular votes going otherwise. This is not the first time The Star has given face to leftists. They published something from Azmi Sharom back in 2013 too. He calls himself a law teacher but is clueless about the nation’s histry. How can he know any law? Have we actually chosen the same people again and again and again for the past 60 years? Really? As a law teacher he ought to know that we have not voted the same people. Tunku Abdul Rahman, Tun Razak, Tun Dr Ismail, Tun HS Lee, Tun Tan Siew Sin, Tun Sambanthan, Tun Manickavasagam, Tun Omar Ong, Tun Ghafar to name a few stalwarts from the Alliance and BN have stood down from elections. 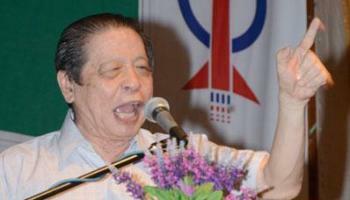 I know for sure that for the past 48 years Lim Kit Siang has been an election candidate, from Kota Melaka to Gelang Patah, and now is planning to move to Pulau Pinang and/or Kedah. We also have a 92-year old dictator who has also offered to contest for Pakatan Harapan. And as for popular vote, is that the legal voting system that we are practising here in this country? If so, why should we vote by constituency? I personally opine that Azmi Sharom is either one stupid person, or is maliciously misleading the people of Malaysia with his lies, and The Star, for publishing such claim, is equally guilty for abetting to the offence no matter the disclaimer. Do you know really want to know what freedom is? Freedom is being free from ignorance, free from being stupid. And especially free from coordinated stupidity. 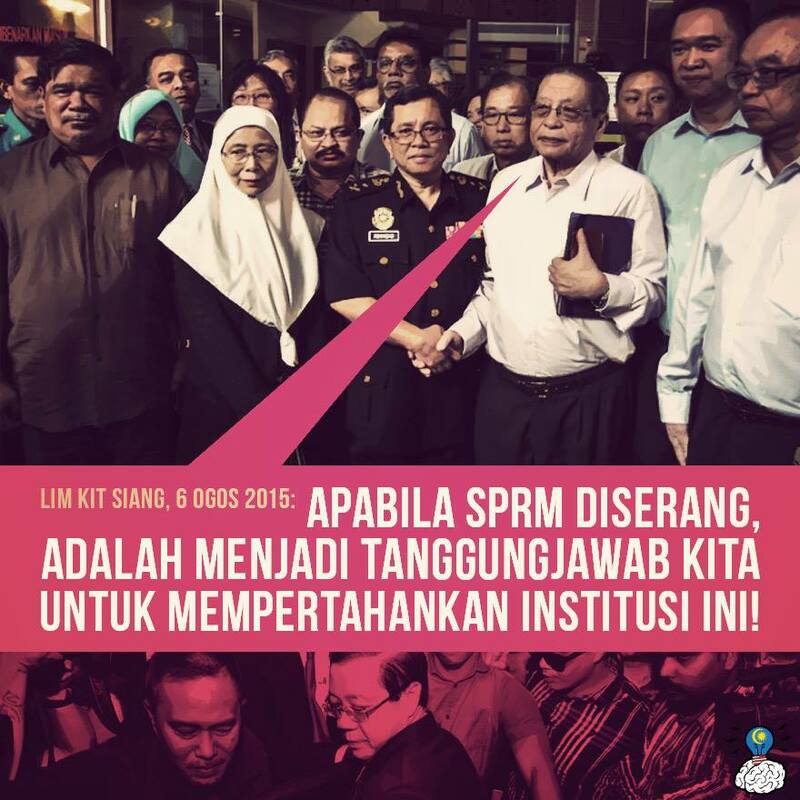 Keep Malaysia stupid-free for the next 60 years and more please! 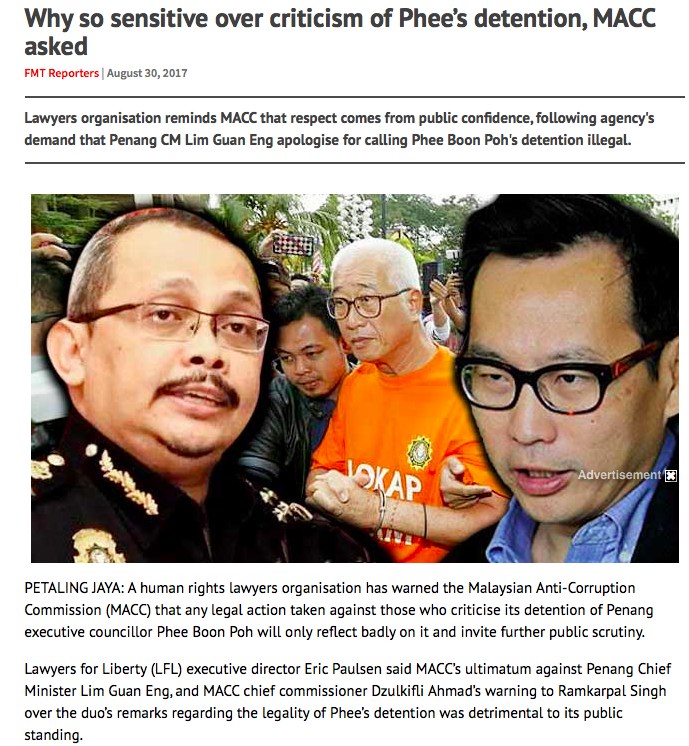 In another blatant attempt to paint a bad picture on the Malaysian Anti Corruption Commision (MACC), lawyer and also DAP Member of Parliament Ramkarpal Singh agreed with Tokong Lim Guan Eng that the detention of Mr So-What Phee Boon Poh was illegal and said such remark is justified. ‘Detention’ here is referred to the detention made after the remand order was received from the Magistrate. This remand order was then set aside by the High Court as it contravened Section 117 (5) of the Criminal Procedure Code. 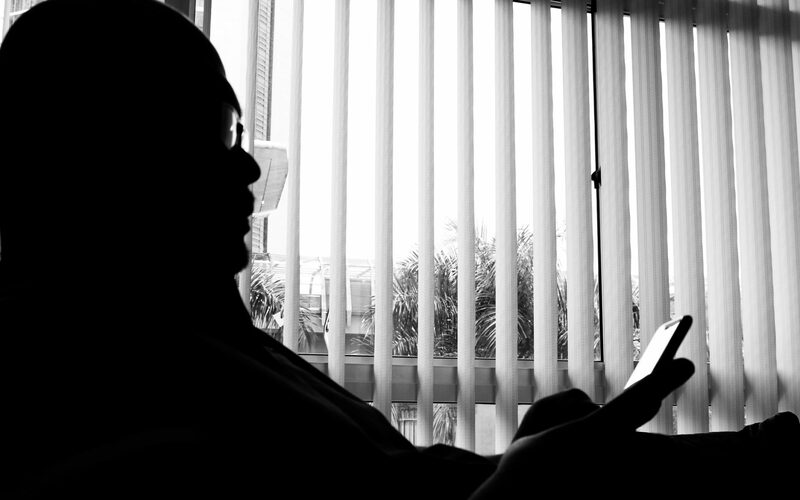 In his ruling, High Court judicial commissioner (JC) Abdul Wahab Mohamed found that the word ‘shall’ in subsection 5 is mandatory, and the respondent has not submitted literature to the contrary. The subsection says the magistrate deciding the period of detention of the accused shall allow representations to be made either by the accused himself or through a counsel of his choice. Phee’s lawyers, Ramkarpal Singh and RSN Rayer, had argued that they were not given a chance by the senior assistant registrar of the Magistrate’s Court on Saturday to air their submissions. Ramkarpal argued that the Magistrate’s Court senior assistant registrar had been prejudiced by allowing the five-day remand without hearing the defence of the accused lawyers. “Wahab’s decision on 14 August 2017, which ruled that the detention of the trio was illegal since it was based on an invalid order, meant that MACC had detained them illegally after the first 24 hours of their initial arrest on 11 August 2017 passed,” Ramkarpal said. “In the circumstances, there can be no doubt that the chief minister was justified in describing the said detention as illegal,” he added. MACC also contended that any remark made by anyone pertaining to the issue is subjudicial and is in contempt of court as the appeal against the quashing of the remand order is already in process. Ramkarpal said neither himself nor Phee had received a copy of the notice, and were not aware that such a notice had been filed, therefore the issue of sub judice should not arise. My question is, how can a remand order made and signed by a Magistrate be illegal? Just because the Magistrate erred in his issuing the remand order does not make the detention illegal. It only means that the remand order has an error, but the detention was made in pursuant of the remand order issued by a Court of law. When filing the notice of appeal with the Registrar of Court, the MACC does not need send a notice of appeal to Phee Boon Poh or his counsel. It is only later when the appeal is not rejected that the Court of Appeal shall notify the parties involved of the time and place for the hearing of the appeal. This is provided for in the Courts of Judicature Act, 1964. And as Phee Boon Poh is still under investigation and was released only from remand and not freed from a prison sentence, any statement made pertaining to his detention is sub judice in nature. This is something Ramkarpal who is an officer of the Court by virtue that he is a legal practitioner ought to know and uphold. 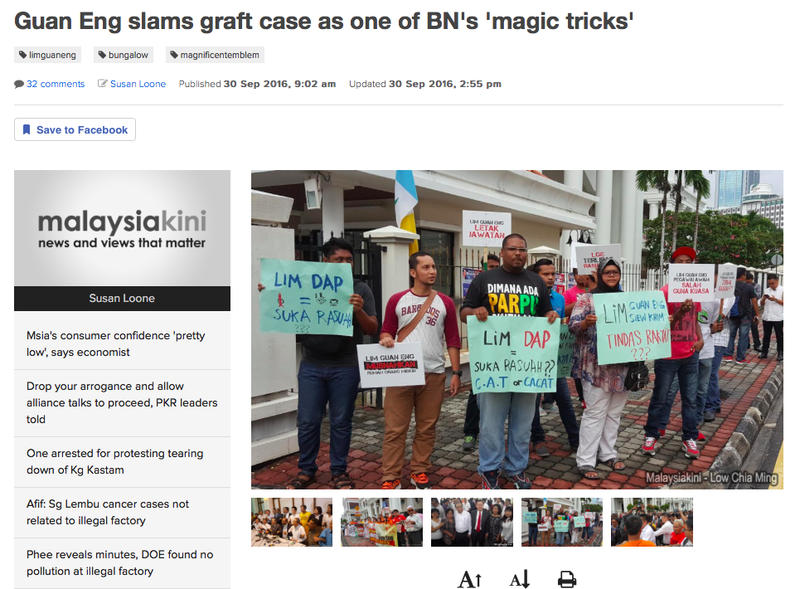 But of course, he is also a DAP Member of Parliament. People from the DAP do not abide by laws of the land and behave like outlaws. 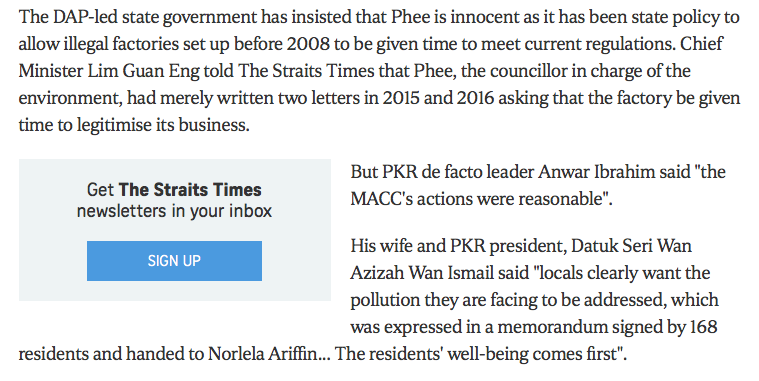 And it is because of this behaviour that Sungai Lembu has cancer occurrences that are 2,343 percent higher than the national average, and this is what the DAP is trying to stop the MACC from investigating, and trying to stop the MACC from protecting the lives of the people who had voted for Pakatan. Sudah menjadi kelaziman ahli politik masa kini terutamanya di kalangan pembangkang untuk membuat kenyataan kepada umum kononnya mereka bersih dan tidak bersalah setelah pihak berkuasa menangkap atau menggeledah premis mereka. Tujuan kenyataan tersebut dibuat tidak lain tidak bukan tetapi untuk membina persepsi umum bahawa mereka menjadi mangsa kezaliman politik dan agensi-agensi penguatkuasaan adalah alat bagi pemerintah untuk menindas pihak pembangkang. Setelah Lim Guan Eng dihadapkan ke mahkamah atas pertuduhan rasuah dan salahguna kuasa tahun lepas, beliau dengan segera mengadakan satu sidang akhbar yang digunakan secukupnya untuk membidas pihak kerajaan terutamanya SPRM yang didakwanya telah sengaja cuba untuk menghalang beliau dari bersuara. Tanpa menunggu perbicaraan dilangsungkan dan tanpa menunggu bahan bukti serta keterangan para saksi, Azmin Ali (yang pentadbirannya juga kini disiasat SPRM) dengan pantas mengisytiharkan beliau yakin Lim Guan Eng bersih dari perlakuan rasuah. Baru-baru ini, Mr “So What?” Pulau Pinang, Phee Boon Poh, telah ditahan oleh SPRM kerana terlibat dalam isu salahguna kuasa berkaitan dengan kebenaran beroperasi sebuah kiang haram di Sungai Lembu. Apabila dibebaskan dari tahanan reman, Phee Boon Poh dengan segera membuat sidang media dan membuat kenyataan bahawa beliau tidak bersalah salaupun kes masih lagi dalam siasatan. Malah semasa Phee Boon Poh ditangkap, Lim Kit Siang sendiri telah membuat kenyataan bahawa tangkapan itu adalah untuk mengaburi mata rakyat terhadap gejala rasuah yang berlaku di dalam negara ini. Apa yang sebenarnya berlaku ialah percubaan DAP untuk mengaburi mata rakyat terhadap kepincangan pentadbiran mereka sendiri. 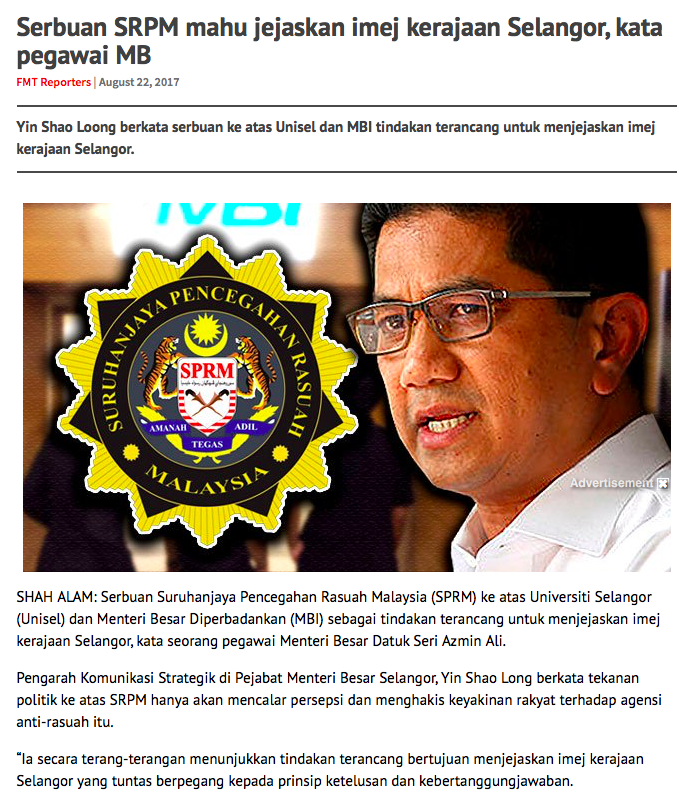 Perkara yang sama juga dilakukan oleh Pengarah Komunikasi Strategik di pejabat Menteri Besar Selangor, Yin Shao Loong, menyifatkan serbuan ke atas UNISEL, Jana Niaga Sdn Bhd dan Menteri Besar DiPerbadankan sebagai usaha untuk menjejaskan imej kerajaan negeri Selangor. 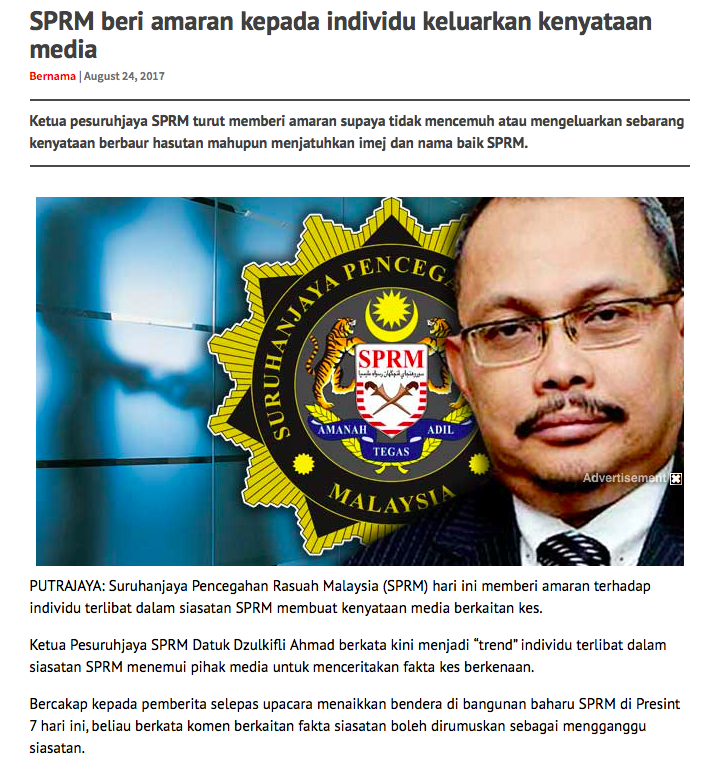 Suruhanjaya Pencegahan Rasuah Malaysia (SPRM) memberi amaran tegas kepada mana-mana pihak atau individu agar tidak mengeluarkan sebarang kenyataan media berhubung kes yang sedang disiasat. SPRM mendapati perkara tersebut telah menjadi satu trend atau amalan ketika ini dan menasihati mereka yang berkenaan supaya memberhentikan perbuatan tersebut kerana ia boleh mengganggu dan menjejaskan perjalanan siasatan. Mana-mana individu atau pihak yang mempunyai sebarang keterangan yang boleh membantu siasatan diminta tampil kepada SPRM untuk dirakam percakapan dan bukan membuat kenyataan media. Justeru, SPRM tidak akan teragak-agak untuk mengambil tindakan terhadap mana-mana individu yang melakukan perbuatan tersebut mengikut Seksyen 48(h) ASPRM yang mana seseorang yang didapati bersalah boleh dikenakan denda tidak melebihi RM10,000 dan penjara dua tahun. Selain itu, SPRM juga memandang serius perbuatan segelintir pihak yang mengeluarkan kenyataan berbaur fitnah terhadap tindakan-tindakan yang diambil oleh SPRM dengan tujuan untuk mencemarkan dan menjejaskan reputasi SPRM. Oleh yang demikian, SPRM tidak akan sama sekali bertolak ansur dengan perbuatan sedemikian dan bersedia untuk mengambil tindakan terhadap mereka yang didapati menyebarkan fitnah tersebut sama ada berbentuk sivil atau jenayah. Eloklah pihak pembangkang berpegang kepada slogan mereka iaitu “Lawan Tetap Lawan“, “Berani Kerana Benar” dan lain-lain lagi yang menunjukkan yang kononnya mereka tidak bersalah, dan lawan serta tunjukkan kebenaran di dalam mahkamah dan bukannya cuba mempengaruhi persepsi rakyat supaya menghakimi SPRM dan bukannya mereka yang disyakki bersalah. Cakap, kena serupa bikin ya! Hari ini Suruhanjaya Pencegahan Rasuah Malaysia (SPRM) telah membuat serbuan ke atas Universiti Selangor (UNISEL) dan Menteri Besar Diperbadankan (MBI) bagi menyiasat pertikaian kontrak membabitkan universiti itu dengan bekas kontraktor, Jana Niaga Sdn Bhd, dan dakwaan rasuah membabitkan RM10 juta. Serbuan ini telah mendatangkan rasa tidak puas hati di pihak kerajaan negeri Selangor. Pengarah Komunikasi Strategik di pejabat Menteri Besar Selangor, Yin Shao Loong, menyifatkan serbuan tersebut sebagai usaha untuk menjejaskan imej kerajaan negeri Selangor. Beliau menambah bahawa tekanan politik ke atas SRPM hanya akan mencalar persepsi dan menghakis keyakinan rakyat terhadap agensi anti-rasuah itu. Persoalannya, adakah benar SPRM dikenakan tekanan politik untuk bertindak terhadap para pegawai kerajaan di negeri-negeri yang ditadbir oleh pihak pembangkang? Jikalau benar, siapa pula yang mengenakan tekanan politik supaya Exco Kerajaan Negeri Johor Latif Bandi dan Veteran UMNO Isa Samad ditangkap? Barisan Nasional atau Pakatan Harapan? Ini memang lumrah pihak pembangkang menuding jari apabila mereka sendiri amalkan budaya hidup rasuah. Mereka akan mencari jalan keluar dengan menyalahkan orang lain. Contoh terbaik adalah apabila beberapa orang Exco Kerajaan Negeri Selangor disiasat oleh SPRM setahun selepas mereka memegang kuasa pentadbiran di negeri tersebut – YA! BARU SETAHUN SUDAH ADA KES RASUAH! Malangnya, saksi yang disoalsiasat ketika itu, Teoh Beng Hock, mati semasa dalam tahanan SPRM. Namun, kematian tersebut dipertanggung jawabkan kepada pihak SPRM dan Barisan Nasional seolah-olah kematian Beng Hock memberi manfaat kepada BN dan bukannya mereka-mereka yang disyaki yang berada dalam kerajaan negeri Selangor yang diterajui mereka. Minggu lepas, Nurul Izzah mengecam SPRM kerana menyerbu sebuah kilang haram dan juga pejabat Exco Kerajaan Negeri Pulau Pinang, Phee Boon Poh. Kata Nurul Izzah lagi, keyakinan rakyat terhadap SPRM berada di tahap yang rendah. Beliau menuduh SPRM sengaja mengenakan ahli politik dari Pakatan dengan pertuduhan-pertuduhan yang remeh untuk menjejaskan pihak pembangkang. 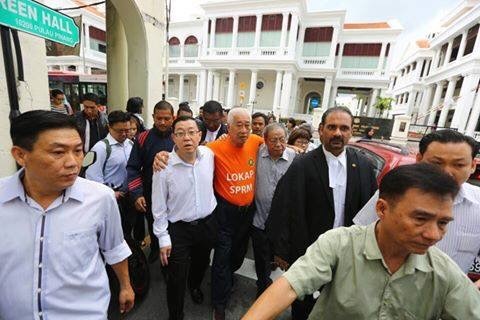 Hari ini, Yin Shao Loong pula telah menggunakan ayat yang sama iaitu persepsi rakyat terhadap SPRM telah tercalar. Selangor ialah satu-satunya negeri yang masih belum menandatangani ‘Ikrar Bebas Rasuah‘ yang disarankan oleh pihak SPRM. Walaupun Menteri Besar Selangor Azmin Ali tidak pernah mengeluarkan sebarang kenyataan mengenai perkara tersebut sendiri, beliau telah diwakili oleh jurucakap beliau iaitu Iskandar Abdul Samad dari parti PAS. Yang menghairankan ialah kerajaan negeri Kelantan yang diterajui oleh PAS telah menandatangani Ikrar tersebut. Malah, Pulau Pinang yang bergelumang dengan kes rasuah juga telah menandatangani Ikrar tersebut. Kenapa Selangor yang setahun jagung sudah disiasat kerana gejala rasuah enggan menandatangani Ikrar tersebut? PAS yang hampir tiada gejala rasuah pun tandatangan Ikrar Bebas Rasuah. Selangor yang disiasat pada tahun pertama berkuasa boleh tak nak tandatangan? 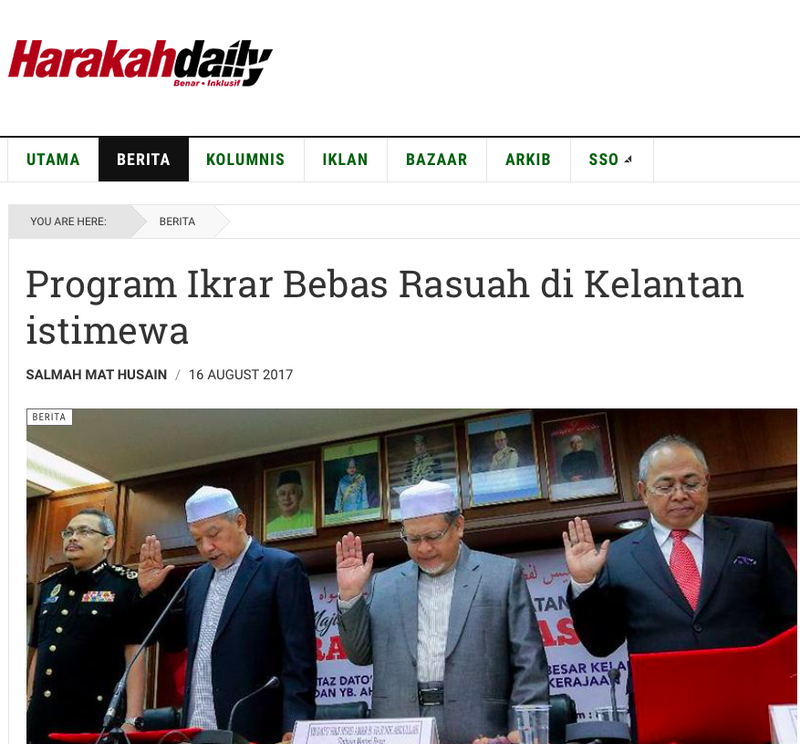 Adakah Iskandar membayangkan bahawa kerajaan negeri Kelantan yang diterajui rakan-rakannya dari PAS adalah kurang berakal berbanding beliau dalam usaha memerangi rasuah? Kenapa beliau sebagai seorang ahli PAS tidak berkongsi sebarang maklumat mengenai cara menangani gejala rasuah oleh Selangor dengan PAS Kelantan? Adakah sebab PAS Kelantan bukan sahabat beliau? Bukankah sebagai seorang ahli PAS beliau sepatutnya bantu memperkukuhkan parti seperti yang dituntut oleh Fasal 16 (3) (e) Perlembagaan Parti Islam SeMalaysia? Sesungguhnya saya tidak faham dengan Yin Shao Loong, Nurul Izzah dan Iskandar Abdul Samad yang memperlekehkan usaha SPRM membanteras gejala rasuah dan salahguna kuasa. Iskandar Abdul Samad tidak berkongsi pengalaman Selangor membanteras rasuah; Nurul Izzah dan Shao Loong memperkecilkan usaha SPRM. Sedangkan Ketua Umum Pakatan Harapan dan Presiden PKR pun sokong akan tindakan SPRM yang meletakkan kepentingan rakyat di atas kepentingan parti-parti politik. Sepatutnya, sebagai sebuah negeri yang bangga dengan kaedahnya sendiri untuk menangani gejala rasuah, kerajaan negeri Selangor sepatutnya menyokong kuat usaha dan bantuan SPRM untuk menentukan bahawa Selangor benar-benar bebas dari budaya rasuah. Rakyat tidak bodoh. Rakyat memerhati. 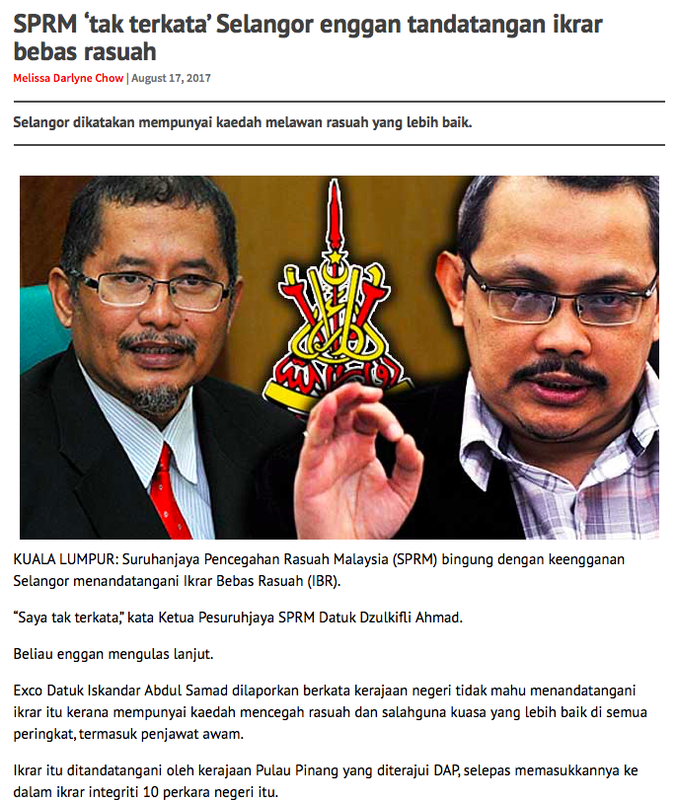 Dan rakyat tahu segala usaha memperkecilkan usaha SPRM memerangi gejala rasuah dan salahguna kuasa bermakna there is SOMETHING FOR SELANGOR TO HIDE. Today is a historic day for the Malaysian Indian community. The man who for 22 years of his life did nothing to help alleviate their socio-economic status has finally sought help, in the most famous phrase, like from one Indian to another Indian. After the meeting, HINDRAF chairman P. Waythamoorthy expressed confidence in delivering Indian votes to help Pakatan in GE14. Of course the Kampung Buah Pala issue has been forgotten and forgiven by Waytha. 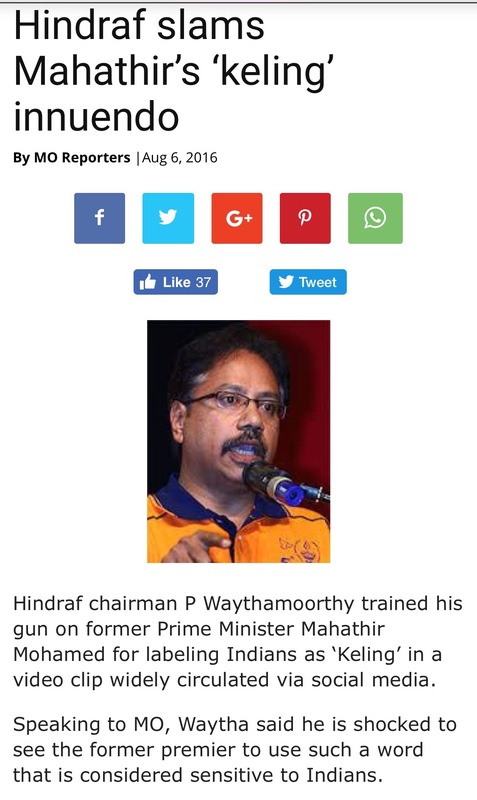 Let us also look at several other Indian-related issues that Waytha had raised when questioning about Mahathir’s ability to lead Pakatan just a year ago this month. Last year, Waytha said the displacement of the estate workers was rampant during Mahathir’s leadership and he failed to provide socio-economic reliefs to the 800,000 Indians displaced from the estates. He ordered the City Councils to demolish the Hindu temples and Hindu grave yards which existed for almost 150 years in the estates. Also according to Waytha it was Mahathir who caused the serious rise in discrimination against the Non- Malays which has caused racism to be entrenched in the administration of the government and yet he would stand next to Nelson Mandela to declare his anti-apartheid vehemence. Mahathir’s arbitrary arrests and detentions of many political opponents under the ISA and Official Secrets Act on many occasions especially for his own political survival how he would hone to perfection and use a gamut of archaic repressive laws. 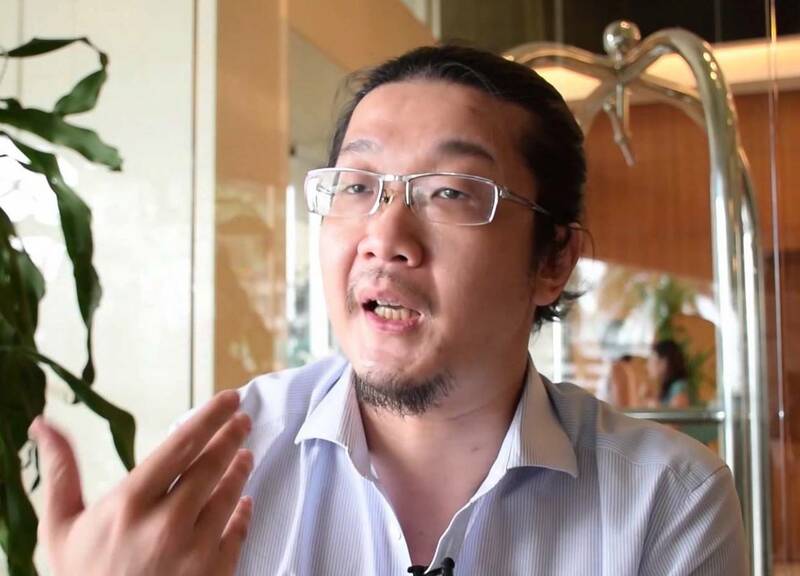 Waytha added that Mahathir’s arrests besides politicians were environmentalists, consumer association spokesmen and also caused the suspension of publication of The Star, The Sunday Star, Watan, Sin Chew Jit Poh under Operasi Lalang. His interference in the Malaysian Judiciary saw the Chief Justice and several top Federal court judges suspended and sacked. The way he went about colluding with Justice Hamid Omar, a senior Federal Court Judge, tarnished the reputation and the integrity of the judiciary till this day. In March 1988, he made constitutional amendments to Article 121 and Article 145 which effectively took away the power of the judiciary that was embedded in the constitution and handed it over to Parliament through statutes. The power of judicial review too was removed. Hence he virtually modified the separation of powers where Judiciary was stripped of its independence and power overnight. Mahathir banned various independent foreign journalists and has records of charging them with various offences. Yes, Mahathir did all that according to Waytha. And it was just a year ago this month that Waytha was mad at Mahathir for using the term ‘Keling‘ as an inference to the Indians. Politics is more than the eyes could see and the mind could perceive. Should one support him blindly for the sake of removing the present premier and replacing him with another. Politics is a strange and dangerous game. Waytha must have said millions other things about Mahathir but all has been forgotten in just one meet – in the name of power. 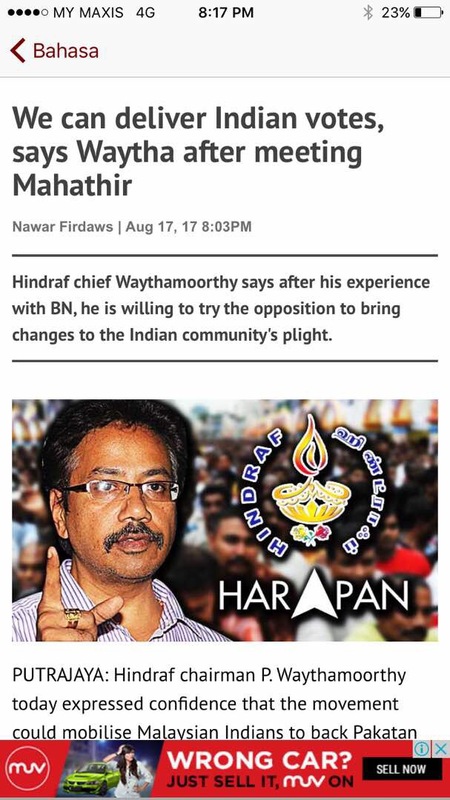 Hopefully Malaysians especially the Indians see how HINDRAF has now gone Waytha out of line.